I’m greatly honored to be able to talk to you today, about the choice among policy instruments for pollution abatement. It is a very difficult but important job you are undertaking, the planning for efforts to reduce emissions of carbon dioxide and other greenhouse gases (GHG). I cannot help you with the details of policies in Europe, but I hope to be able to clarify a few of the conceptual issues in the choice of policy. All pollution abatement polices can be grouped into two broad categories. On the one hand, we have traditional regulations such as technology mandates or performance standards. Examples include energy efficiency standards, building codes, mandated use of renewable fuels, scrubber requirements, and vehicle fuel efficiency standards. On the other hand, we have market-based economic incentives that impose a price per ton of emissions. Examples include a carbon tax or cap-and-trade permit system. In the comparison among these alternatives, I will focus primarily on cost efficiency, by which I mean the ability to achieve the minimum total cost for any given amount of abatement. In this regard, all of the policies listed above could achieve the same cost efficiency, if policymakers have full information about all the costs of all the technologies. With only the use of regulatory mandates, for example, then legislative bodies would have to specify which areas should use wind or solar power, which areas have ready access to natural gas, and which areas have geology that might be favorable for carbon sequestration and storage. Policymakers would have to identify the cost-effective technologies for each different product or activity. If all this information were available, and the regulations required only the least-cost ways to cut greenhouse gas emissions, then this approach could be perfectly cost effective. In contrast, the use of a carbon tax or permit system effectively imposes a price per ton of carbon or other greenhouse gas emissions. For sulfur dioxide and other pollutants, such pricing requires measuring emissions that actually emerge from each smokestack. Emissions of carbon dioxide do not have to be measured directly, however, because those emissions are directly related to the carbon content of the fuel being burned. A tax or permit price can be imposed on each ton of coal at a rate that reflects the carbon content of that coal, and on each barrel of oil at a rate that reflects that carbon content. In fact, this price is even easier to collect if it is imposed not “downstream” on each of the millions of businesses that burn fossil fuel, but instead “upstream” on the relatively few firms that produce such fuel (that is, at the mine mouth, oil well, or natural gas pipeline). Either way, it raises the price of fuel that is carbon intensive, and therefore reduces the use of whatever fuel is the most carbon intensive. So far, the various alternative policies could be roughly equivalent. If a cap-and-trade system limits the total amount of carbon dioxide and drives the price of a permit up to €16 per ton, then that policy has the same effect as a carbon tax at the rate of €16 per ton. With full information, the two “market-based” incentive policies are identical. The difference between them is subtle, and it only arises with uncertainty or imperfect information about the costs of alternative abatement technologies. In that case, a carbon tax places a clear and certain price per ton of carbon dioxide emissions, and it encourages all of the cheapest forms of abatement, but policymakers cannot be sure about exactly how much abatement will be undertaken. In contrast, a cap-and-trade system places a clear and certain limit on the total amount of emissions, to achieve a certain amount of abatement, but we cannot be sure exactly what the price is going to be. Either way, however, a price per ton of emissions achieves cost-efficiency, because it provides incentives to businesses and households to undertake any abatement that costs less than the price per ton of emissions, and it encourages them to forego any form of abatement that costs more than the imposed price per ton of emissions. This discussion now brings us to the major difference between market-based incentives and the other more traditional forms of regulations like technology mandates or performance standards. And this difference is large and important, not subtle. In most cases, policymakers are never going to know the cost of each technology or method of pollution abatement. That information may be very technical, and it is specific to each firm or each location. Only the engineers within a firm may be able to figure out what are that firm’s most cost-effective technologies. Any mandates imposed from outside are unlikely to require the cheapest technologies, and they may require some very expensive technologies. Only omniscient policymakers could achieve cost-effective abatement. Because this point is so important, let me elaborate by example. The sector covered by the permit system includes many kinds of activities with many possible abatement projects, but consider just the six projects shown in the graph. Each may have a very different cost per ton of abatement. If a set of mandates were to choose imperfectly, it could require expensive technologies and miss some cheaper options. With a single price of €16 per ton, however, then the various businesses could choose for themselves, knowing what they know about the costs of their own technologies. All projects cheaper than €16 per ton are undertaken, and the expensive ones are not. Now consider the second part of the graph, showing some projects in the sector not covered by the permit trading system. 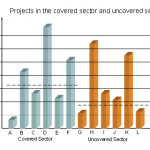 With no policy in the uncovered sector, then none of these projects may be undertaken by firms there, even cheap projects that cost less than €16 per ton. Again, policymakers could try to “pick the winners”, but perhaps without the inside information required to know which are really the most cost-effective methods of abatement. Imperfect mandates could require some expensive options, and skip some of the cheapest ones. Finally, consider a carbon tax in the uncovered sector. If the tax is set at a rate of, say, €10 per ton, then the firms have incentive to undertake any project that costs les than €10 per ton of abatement, and not the more expensive ones. In this case, abatement is cost-effective within the uncovered sector. Unless the rate of tax in the uncovered sector is the same as the permit price in the covered sector, however, the overall effort is not really efficient. In the example of the second graph, where the permit price is €16 per ton and the tax is €10 per ton, then the uncovered sector would not undertake the two projects that cost €11-14 per ton, even though those projects cost less than some of the €16 projects undertaken in the covered sector. In fact, overall efficiency is improved by making the tax rate in the uncovered sector closer to the actual permit price in the covered sector. The action taken to local and national disasters is noble but it’s a damn shame that so many people take advantage of the sad situations.